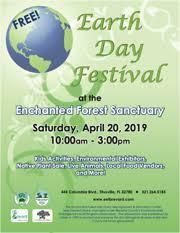 The Enchanted Forest Sanctuary is hosting its annual Earth Day celebration. Guests can enjoy various activities ranging from guided hikes, live music, arts and crafts, and more. The more adventurous attendees can celebrate nature by exploring environmental exhibits and meet local Florida wildlife such as bats. The Earth Day festival will also feature many children’s activities including face painting and other hands-in activities. Admission is free but the event lasts for one day only: Saturday, April 20 from 10 a.m. to 3 p.m. The Enchanted Forest Sanctuary is located at 444 Columbia Blvd., Titusville, FL. For more information on the event or the Enchanted Forest Sancutary, visit www.eelbrevard.com or call (321) 264-5185. The festival is overseen by the Brevard County Environmentally Endangered Lands (EEL) program. The EEL Program was established in 1990 to protect the natural habitats of Brevard County by acquiring environmentally sensitive lands for conservation, passive recreation, and environmental education.